A custom dining table made of high-lacquered walnut, oak and bone and surrounded by a mix of seating centers the dining room. The baby grand piano in the alcove helps to turn the room into an entertaining area. Contemporary art and a sleek sofa with curved arms help to modernize the room. 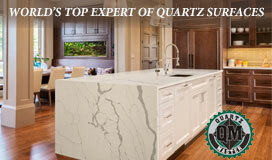 A traditional space gets a fresh look and expanded purpose. 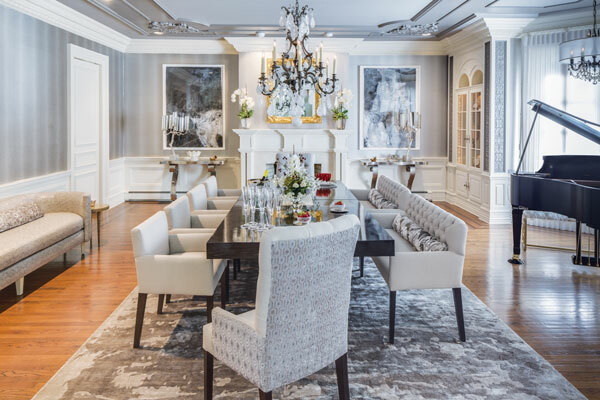 Anna Maria Mannarino wanted to respect the traditional bones of the dining room in the 2015 Designer Showhouse of New Jersey, but also to freshen the look and make it more than just a place to share a meal. 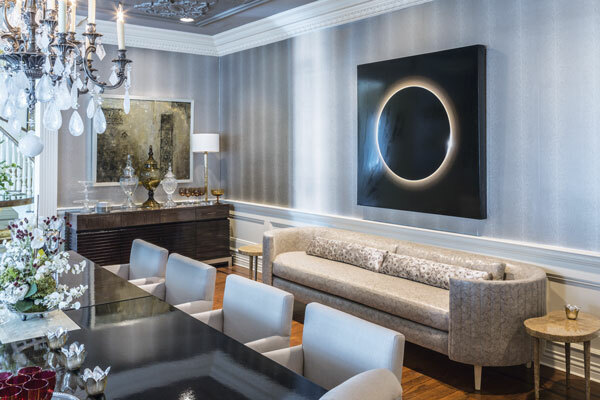 Mannarino began with a soothing palette of ivory and midtone and dark grays on the trim and ceiling and a silvery shagreen wall covering. Then she chose contemporary furniture and accessories infused with some classic elements. The dining table, for example, is walnut, oak and bone with a high-lacquer finish. It’s surrounded by comfortable chairs and benches sitting on a silk area rug and crowned with a custom chandelier dripping with large rock crystals. Other elements include forged steel consoles that flank a fireplace topped with an 18k goldleafed mirror, a sleek curved sofa covered in python-print linen and a lacquered server. Art also plays an important role. “I wanted pieces that make a strong statement in scale and subject. One is the Sheba Sharrow Worrier diptych above the metal consoles flanking the fireplace; another is Nick Gonzales Goad’s Eclipse over the sofa. Throughout the space a mix of silver, gold, crystal and glass accessories grace the dining table, server and two built-in display cabinets. Design, Mannarino Designs Inc. in Holmdel; dining table, seating at table and server, Più Design, an Ecuadorian company with a U.S. location in Yonkers, New York; chandelier above table, American Brass and Crystal in Union; curved sofa, Shine by Sho through the Red Bank Design Center in Red Bank; consoles and candelabras on consoles, Creative Displays and Designs Inc. in Tinton Falls; art hanging above the sofa, server and consoles, James Yarosh Associates Fine Art & Design in Holmdel; china and crystal, The China Closet in Fair Haven; mirror above fireplace and small tables on both ends of sofa, private owner; wall covering and pillows on seating at table and on the sofa, Romo Inc. in Boston; rug, Creative Touch in Secaucus; general contractor, BDHI through Mannarino Designs Inc.; paint, Benjamin Moore.